One of the best ways to enjoy Lodi is with an afternoon of shopping at one-of-a-kind boutiques. Provides top quality estate sales service in the area- will address all concerns and questions selling your estate items PLUS save you time and frustration in the process. When Was the Last Time Your Feet Were Measured? Burton's believes proper fit equals comfort. Specializes in helping to find great options for difficult sizes. Satisfaction guaranteed. Consignment store carrying antiques, vintage, and handcrafted items such as furniture, jewelry, stained glass, paintings, and so much more from local artisans. Since 1984, Danz Jewelers has proudly serviced Lodi and its surrounding areas with the largest selection of diamonds, custom jewelry designs, and quality repairs. Great source for one-of-a-kind home and garden decor. Home and garden boutique with a French twist. One-of-a-kind pieces to bring a Parisian flare to your home. Joe Hassan's Clothing and Western Wear. Lodi's place for work boots, work wear, athletic shoes, apparel, outerwear, and western wear. Decor for home and garden. Vintage items, handcrafted iron decor, gifts, plants and specialized woodworking. One of a kind items. The best selection of new comics and trade paperbacks in the area! They also carry a selection of Action Figures, Board Games, Roleplaying Games, Warhammer, and CCGs. Minerva's Furniture features a great selection of living room, bedroom, dining room, home office, entertainment, accent, furniture, and mattresses! Nava & Co Boutique-Studio opened October 1, 2015. Our boutique creatively showcases vintage furniture, artists, one of a kind jewelry, and gifts for all occasions as well as art classes. Hand painted personalized gifts for everyone! Local clothing boutique, established for more than 26 years. Pret offers an array of high-quality, unique outfit options, perfect for special occasions or everyday dress. Rydel Vacuums would like to thank you for stopping by our website and considering us for your next new vacuum, central vacuum or vacuum repair. We have beautiful jewelry for all price ranges. Come in and check out our great selection! Adventures in literature await you here at The Book Lady. Flip through the many options to find your next written get-away. A two-story antique shop filled with a variety of amazing items. Come discover your next treasure! We Specialize in making memorable wedding and formal looks that are sure to amaze. We pride our self on taking extra time and patience to make sure your big day is perfect. Eclectic home and garden boutique. Looking for a new piece to add to your home decor? Stop by Voila Gifts & Home Decor! 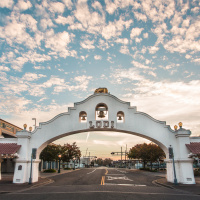 Here's a list of 10 Can't-Miss Spots in Downtown Lodi.